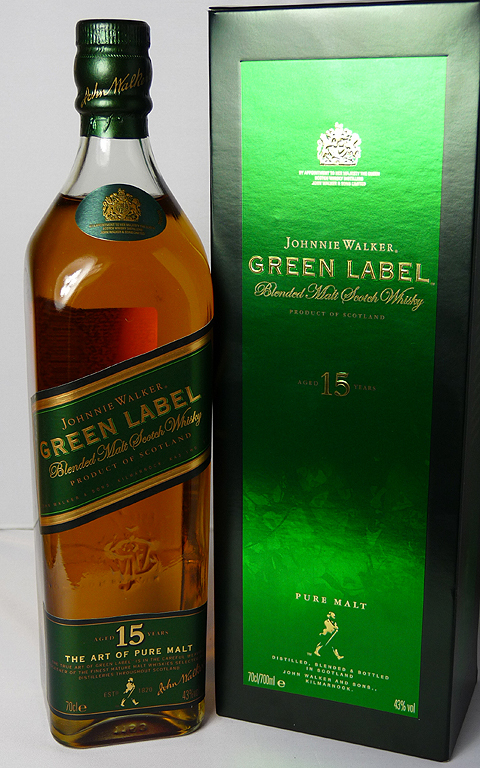 The Johnnie Walker ‘Green Label’ first appeared in 2005 but by 2013 it was discontinued everywhere other than in Asia. In 2015 it returned (hurray!) with a limited edition to mark its 10-year anniversary. But rather than disappear again it has remained due to popular demand, and by having enough stock of the whisky that go into this blended malt. As it states on the box this is a vatting together of Talisker, Linkwood, Cragganmore and Caol Ila, which all have to be a minimum of 15 years old. And with no grain whisky to interfere with the mix you get to play a guessing game as to which of these 4 classic single malts you can spot in the taste. Although ratings appear to be good the new GL clearly has its faults, especially to those who tried the previous incarnation. When Ralfy did his first YouTube review of the GL in 2010 he scored it a fantastic 89/100 but in his re-review in 2016 (below) he’s downgraded it to 84/100. He felt it had been slightly sanitised since his last review. ‘Malts of Montreal’ says in his YouTube review of September 2015 (here) that the old version was more smoky and peaty whereas the new GL is sweeter. This could well upset the Coal Ila and Talisker fans and I certainly didn’t taste as much Talisker as I was hoping when I tried it. But overall, without comparison to the previous version, the Johnnie Walker Green Label is a good blended malt and an enjoyable experience on the palate. The only local source I could find for the Green Label was ASDA. Links I found online often lead to whisky shops saying it was “no longer in stock”. One link showed an old price of £40 but when I clicked through to the shop the latest price was £50! Thankfully it was nearly half that in ASDA. It’s tempting not to drink it and put it away for a decade or two and then see how much it’s worth. But I haven’t tasted it yet, so scrub that idea! Another confirmation about the demise of the Green Label is its omission from the Whisky Bible 2013. In the 2010 and 2012 editions it was awarded ‘Scotch Vatted Malt Of The Year’ with 95/100. It seems a shame that such a good whisky is to become a thing of the past.